Scroll down for the free, professionally read, audio book (of 16 MP3s), The Ten Commandments, by one of the greatest Puritan authors, Thomas Watson. 50 more free MP3s, on the ten commandments, by other Reformed pastors, follow Thomas Watson's Ten Commandments audio book. Below these 66 free Reformation MP3s you will also find links to free and discounted versions of Thomas Watson's book, The Ten Commandments, in various text formats (PDF, .mobi [Kindle, Web, etc.). Moreover, after all these free resources, don't miss the longer quotation from Thomas Watson's Ten Commandments about loving God by the power of the Holy Spirit through a sound biblical knowledge of God's will, which is revealed in His moral law (and summarized in the ten commandments). Additionally, 119 resources by Thomas Watson (books [PDFs] and audio [MP3s]) are available on the the Puritan Hard Drive. "The Puritan Hard Drive is an astonishing piece of work. The scope of material is vast and the search facility is a tremendous bonus. There is enough here to fill a lifetime of study and it is a magnificent tool for genuine research (not to make us all superficial 'experts' in historical theology without proper study!). There are works from a huge number of Reformed worthies of the past and audio sermons up to the present. 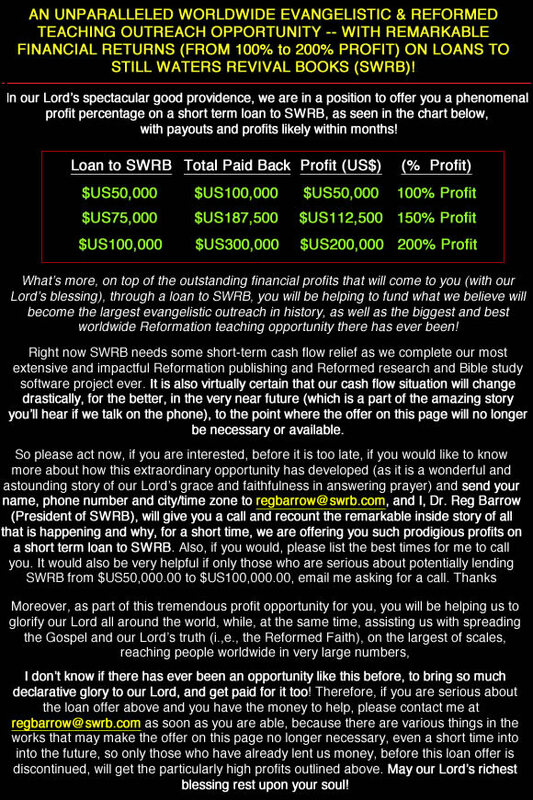 We commend SWRB for making this wealth of material available to the people of God. With such edifying resources at our fingertips, what excuse have we left for our spiritually supine state?" - Pastor David Silversides (Loughbrickland Reformed Presbyterian Church, Northern Ireland), Author, Theologian, etc. The Master Search Index is where some of the greatest search and research opportunities exist on the Puritan Hard Drive. For example, a search for "ten commandments" using the Master Search Index on the Puritan Hard Drive returns 2,543 results in 443 documents , and a search for "God's law," using the Master Search Index on the Puritan Hard Drive returns 4,166 results in 656 documents. Additionally, a Master Search Index search for "first commandment," on the Puritan Hard Drive returns 1,074 results in 241 documents and a Master Search Index search for "second commandment," returns 1,430 results in 266 documents. Moreover, all these search results are available in the context of one line and listed alphabetically by book title, including the author of each book. Furthermore, if you click on any of the individual Master Search Index results, for any of these searches noted above,the Puritan Hard Drive opens the book to the correct page and highlights these results -- and will do the same for any word or phrase you use, in the Master Search Index! The Master Search Index on the Puritan Hard Drive gives you unparallelled biblical research power to mine the gems of the biggest and best Puritan and Reformed digital book collection ever available in this format. Never before have such powerful search and research capabilities existed! May our Lord get all the glory for the great things He has done! To LOVE anything more than God, is to make it a god (idol - ed.). If we love our ESTATE more than God, we make it a god. The young man in the gospel loved his gold better than his Savior; the world lay nearer his heart than Christ. Matt 19:22. "This gold with its glitter blinds the eyes." The covetous man is called an idolater. Eph 5:5. Why so? Because he loves his estate more than God, and so makes it his god (idol -ed.). Though he does not bow down to an idol, if he worships the engraved image in his coins, he is an idolater. That which has most of the heart, we make a god (idol - ed.) of. If we love our PLEASURE more than God, we make a god (idol - ed.) of it. "Lovers of pleasures more than lovers of God." 2 Tim 3:4. Many let loose the reins, and give themselves up to all manner of sensual delights; they idolize pleasure. "They take the timbrel, and the harp, and rejoice at the sound of the organ. They spend their days in mirth." Job 21:12, 13. I have read of a place in Africa, where the people spend all their time in dancing and making merry; and have not we many who make a god of pleasure, who spend their time in going to plays and visiting ball-rooms, as if God had made them like the leviathan, to play in the water? Psalm 104:26. In the country of Sardinia there is a certain herb, that if any one eats too much of it, he will die laughing: such a herb is pleasure, if anyone feeds immoderately on it, he will go laughing to hell. Let such as make a god of pleasure read but these two Scriptures. "The heart of fools is in the house of mirth." Eccl 7:4. "She has lived in luxury and pleasure, so match it now with torments and sorrows." Rev 18:7. Sugar laid in a damp place turns to water; so all the sugared joys and pleasures of sinners will turn to the water of tears at last. If we love our BELLY more than God, we make a god (idol - ed.) of it. "Whose god is their belly." Phil 3:19. Clemens Alexandrinus writes of a fish that had its heart in its belly; an emblem of epicures, whose heart is in their belly; their belly is their god, and to this god they pour drink offerings. The Lord allows what is fitting for the recruiting of nature. "I will send grass, that you may eat and be full." Deut 11:15. But to mind nothing but the indulging of the appetite, is idolatry. "Whose god is their belly." What pity is it, that the soul, that princely part, which sways the scepter of reason and is akin to angels, should be enslaved to the brutish part! If we love a CHILD more than God, we make a god (idol - ed.) of it. How many are guilty in this kind? They think more of their children, and delight more in them than in God; they grieve more for the loss of their first-born, than for the loss of their first love. This is to make an idol of a child, and to set it in God's place. Thus God is often provoked to take away our children. If we love the jewel more than him who gave it, God will take away the jewel, that our love may return to him again. - Thomas Watson on the first commandment, from the book The Ten Commandments (emphases added). This volume, The Ten Commandments, is one of three that make up Thomas Watson's complete Body of Practical Divinity. "One of the most precious of the peerless works of the Puritans, and those best acquainted with it prize it most.' - Charles Spurgeon. There are 637 Reformation resources (books, MP3s and videos) under the category " God's Law, The Ten Commandments, etc.," 6,401 Reformation resources (books, MP3s and videos) under the category "Sanctification, Prayer and Holiness" and 574 Reformation resources (books, MP3s and videos) under the category " Reformed Worship, The Regulative Principle, etc.," on the Puritan Hard Drive -- three categories that directly concern our understanding of our duties before God, as they are revealed in Scripture, regarding family, marriage, raising children and many other related topics. There are 120 Reformation resources with the word "Commandment" in the title on the Puritan Hard Drive. The word "commandment" also occurs171 times in the Puritan Hard Drive resource descriptions. Moreover, it takes just the click of a button (and less than a second, once you have added your search word or phrase) to look up any other words related to the family, on the Puritan Hard Drive. Sabbath Keeping: A Biblical Defense by Reformed Ministers from the Past by Robert Lewis Dabney, Thomas Boston, Thomas Ridgeley, Robert Shaw, Edward Fisher, James Bannerman, et al. Scroll down, at the landing page, for the links above, for direct links to these resources. Reformed Worship, The Regulative Principle (Second Commandment), etc. Question 102: What is the sum of the four commandments (the first four commandments - ed.) which contain our duty to God? Answer: The sum of the four commandments containing our duty to God is, to love the Lord our God with all our heart, and with all our soul, and with all our strength, and with all our mind. Answer: These words before me, or before my face, in the first commandment, teach us, that God, who sees all things, takes special notice of, and is much displeased with, the sin of having any other God: that so it may be an argument to dissuade from it, and to aggravate it as a most impudent provocation: as also to persuade us to do as in his sight, Whatever we do in his service. - The Westminster Larger Catechism, found in the printed book The Westminster Confession of Faith, 1647 (Original Edition, Free Presbyterian Publications, emphases added). How must our love to God be characterized? (1) Love to God must be PURE and GENUINE. He must be loved chiefly for himself. We must love God, not only for his benefits -- but for those intrinsic excellencies with which he is crowned. We must love God -- not only for the good which flows from him -- but for the good which is in him. True love is not mercenary, he who is deeply in love with God, needs not be hired with rewards, he cannot but love God for the beauty of his holiness; though it is not unlawful to look for benefits. Moses had an eye to the recompense of reward (Heb 11:26); but we must not love God for his benefits only, for then it is not love of God -- but self -- love. (2) Love to God must be with ALL THE HEART. "You shall love the Lord your God with all your heart." Mark 12:30. We must not love God a little, give him a drop or two of our love; but the main stream must flow to him. The mind must think of God, the will choose him, the affections pant after him. The true mother would not have the child divided, nor will God have the heart divided. We must love him with our whole heart. Though we may love the creature -- yet it must be a subordinate love. Love to God must be highest, as oil swims above the water. (3) Love to God must be FLAMING. To love coldly, is the same as not to love. The spouse is said to be, "love-sick." Canticles 2:5. The seraphim are so called, because of their burning love. Love turns saints into seraphim; it makes them burn in holy love to God. Many waters cannot quench this love. How may we know whether we love God? (1) He who loves God desires his presence. Lovers cannot be long asunder, they soon have their fainting fits, for lack of a sight of the object of their love. A soul deeply in love with God desires the enjoyment of him in his ordinances, in Word, prayer, and sacraments. David was ready to faint away and die when he had not a sight of God. "My soul faints for God." Psalm 84:2. Such as care not for ordinances plainly manifest lack of love to God. (2) He who loves God, does not love sin. "You who love the Lord, hate evil." Psalm 97:10. The love of God, and the love of sin, can no more mix together than iron and clay. Every sin loved, strikes at the being of God. He who loves God, has an antipathy against sin. He who would part two lovers is a hateful person. God and the believing soul are two lovers; sin parts between them, therefore the soul is implacably set against it. By this try your love to God. How could Delilah say she loved Samson, when she entertained correspondence with the Philistines, who were his mortal enemies? How can he say he loves God who loves sin, which is God's enemy? (3) He who loves God is not much in love with anything else. His love is very cool to worldly things. His love to God moves swiftly, as the sun in the sky; to the world it moves slowly, as the sun on the dial. The love of the world eats out the heart of piety; it chokes holy affections, as earth puts out the fire. The world was a dead thing to Paul. "The world is crucified unto me and I to the world." Gal 6:14. In Paul we may see both the picture and pattern of a mortified man. He who loves God -- uses the world but chooses God. The world is his pension -- but God is his portion. Psalm 119:57. The world engages him -- but God delights and satisfies him. He says as David, "God, my exceeding joy," Psalm 43:4. That is, "God is cream of my joy!" (4) He who loves God cannot live without him. Things we love we cannot be without. A man can do without music or flowers -- but not food. Just so, a soul deeply in love with God looks upon himself as undone without him. "Hide not your face from me, lest I be like those who go down into the pit." Psalm 143:7. He says as Job, "I went mourning without the sun;" chapter 30:28. I have starlight, I lack the Sun of Righteousness; I enjoy not the sweet presence of my God. If God is our chief good--we cannot live without him! Alas! how do they show they have no love to God who can do well enough without him! Let them have but food and drink, and you shall never hear them complain of the lack of God. (5) He who loves God will be at any pains to get him. What pains the merchant takes, what hazards he runs, to have a rich return from the Indies! "The merchant races to the farthest Indies." Jacob loved Rachel, and he could endure the heat by day, and the frost by night, that he might enjoy her. A soul that loves God will take any pains for the fruition of him. "My soul follows hard after you." Psalm 63:8. Love is "the pendulum of the soul." Augustine. It is as the weight which sets the clock going. It is much in prayer, weeping, fasting; it strives as in agony, that he may obtain him whom his soul loves. Plutarch reports of the Gauls, an ancient people of France, that after they had tasted the sweet wine of Italy, they never rested until they had arrived at that country. He who is in love with God, never rests until he has a part in him. "I will seek him whom my soul loves." Canticles 3:2. How can they say they love God, who are not industrious in the use of means to obtain him? "A slothful man hides his hand in his bosom." Prov 19:24. He is not in agony -- but lethargy. If Christ and salvation would drop as a ripe fig into his mouth, he would be content to have them; but he is loath to put himself to too much trouble. Does he love his friend, who will not undertake a journey to see him? (6) He who loves God, prefers him before estate and life. Before estate. "For whom I have suffered the loss of all things." Phil 3:8. Who that loves a rich jewel, would not part with a flower for it? Galeacius, marquis of Vico, parted with a large estate to enjoy God in his pure ordinances. When a Jesuit persuaded him to return to his popish religion in Italy, promising him a large sum of money, he said, "Let their money perish with them who esteem all the gold in the world worth one day's communion with Jesus Christ and his Holy Spirit." Before life. "They loved not their lives unto the death." Rev 12:2: Love to God carries the soul above the love of life and the fear of death. (7) He who loves God loves his favorites, the saints.1 John 5:1. "The mind reacts to the likeness of an object just as it does to the object itself." To love a man for his grace, and the more we see of God in him, the more we love him, is an infallible sign of love to God. The wicked pretend to love God -- but hate and persecute his image. Does he love his prince, who abuses his statue, or tears his picture? They seem indeed to show great reverence to saints departed; they have great reverence for Paul, and Stephen, and Luke; they canonize dead saints -- but persecute living saints; and do they love God? Can it be imagined that he loves God -- who hates his children because they are like him? If Christ were alive again, he would not escape a second persecution. (8) If we love God, we cannot but be fearful of dishonoring him, as the more a child loves his father the more he is afraid to displease him, and we weep and mourn when we have offended him. "Peter went out and wept bitterly." Matt 26:75. Peter might well think that Christ dearly loved him when he took him up to the mount where he was transfigured, and showed him the glory of heaven in a vision. That he should deny Christ after he had received such signal tokens of his love, broke his heart with grief. "He wept bitterly." Are our eyes dropping tears of grief for sin against God? It is a blessed evidence of our love to God; and such shall find mercy. "He shows mercy to thousands of those who love him." Use. Let us be lovers of God. We love our food, and shall we not love him who gives it? All the joy we hope for in heaven, is in God; and shall not he who shall be our joy then, be our love now? It is a saying of Augustine, "Is it not punishment enough, Lord, not to love you?" And again, "I would hate my own soul if I did not find it loving God." What are the INCENTIVES to provoke and inflame our love to God? (1) God's benefits bestowed on us. If a prince bestows continual favors on a subject, and that subject has any sincerity, he cannot but love his prince. God is constantly heaping benefits upon us, "filling our hearts with food and gladness." Acts 14:17. As streams of water out of the rock followed Israel wherever they went, so God's blessings follow us every day. We swim in a sea of mercy! That heart is hard, which is not prevailed with, by all God's blessings -- to love him. "Love attracts love." Kindness works even on a brute -- the ox knows his owner. (2) Love to God would make duties of religion facile and pleasant. I confess that to him who has no love to God, religion must needs be a burden; and I wonder not to hear him say, "What a weariness is it to serve the Lord!" It is like rowing against the tide. But love oils the wheels, it makes duty a pleasure. Why are the angels so swift and winged in God's service -- but because they love him? Jacob thought seven years but little for the love he bore to Rachel. Love is never weary. He who loves money is not weary of counting it: and he who loves God is not weary of serving him. (3) Love to God is advantageous. There is nothing lost by love to God. "Eye has not seen, etc., the things which God has prepared for those who love him." 1 Cor 2:9. Such glorious rewards are laid up for those who love God, that as Augustine says, "they not only transcend our reason -- but faith itself is not able to comprehend them." A crown is the highest ensign of worldly glory; but God has promised a "crown of life to those who love him," and a never -- fading crown. James 1:12. 1 Pet. 5:4. (4) By loving God we know that he loves us. "We love him because he first loved us." 1 John 5:19. If ice melts, it is because the sun has shone upon it; so if the frozen heart melts in love, it is because the Sun of Righteousness has shone upon it. What MEANS should be used to excite our love to God? (1) Labor to know God aright. "We cannot love that which we do not know." God is the most comprehensive good; all excellencies which lie scattered in the creature, are united in him; he is optimus maximus. Wisdom, beauty, riches, love, all concentrate in him. How fair was that tulip which had the colors of all tulips in it! All perfections and sweetnesses are eminently in God. Did we know God more, and by the eye of faith see his orient beauty, our hearts would be fired with love to him! (2) Make the Scriptures familiar to you. Augustine says that before his conversion he took no pleasure in Scripture -- but afterwards it was his chief delight. The book of God discovers God to us, in his holiness, wisdom, power, and truth; it represents him as rich in mercy, and encircled with promises. Augustine calls the Scripture a golden epistle, or love -- letter, sent from God to us. By reading this love -- letter we become more enamored with God; as by reading lascivious books, comedies, romances, etc., lust is excited. (3) Meditate much upon God, and this will promote love to him. "While I was musing, the fire burned." Psalm 39:3. Meditation is as bellows to the affections. Meditate on God's love in the gift of Christ. "God so loved the world that he gave his only begotten Son," etc. John 3:16. That God should give Christ to us, and not to the angels that fell, that the Sun of Righteousness should shine in our horizon, that he is revealed to us, and not to others; what wonderful love is this! "Can one go upon hot coals, and his feet not be burned?" Prov 6:28. Who can meditate on God's love, who can tread on these hot coals, and his heart not burn in love? Beg a heart to love God. The affection of love is natural -- but not the grace of love. Gal 5:22. This fire of love is kindled from heaven; beg that it may burn upon the altar of your heart. Surely the request is pleasing to God, and he will not deny such a prayer as "Lord, give me a heart to love you." VII. "And KEEP my commandments." Love and obedience, like two sisters, must go hand and hand. "If you love me, keep my commandments." John 14:15. "We show our love, by performing the work." The son who loves his father will obey him. Obedience pleases God. "To obey is better than sacrifice." 1 Sam 15:22. In sacrifice, only a dead beast is offered; in obedience, a living soul. In sacrifice, only a part of the fruit is offered; in obedience, fruit and tree and all; man offers himself up to God. "Keep my commandments." It is not said, God shows mercy to thousands who know his commandments -- but who keep them. Knowing his commandments, without keeping them -- does not entitle any to mercy. The commandment is not only a rule of knowledge -- but of duty. God gives us his commandments, not only as a pleasant picture to look upon -- but as his will and testament, which we are to perform. A good Christian, like the sun, not only sends forth light -- but makes a circuit around the world. He has not only the light of knowledge; but moves in a sphere of obedience. We should keep the commandments from FAITH. Our obedience ought to spring from faith. It is called, therefore, "the obedience of faith." Rom 16:26. Abel, by faith, offered up a better sacrifice than Cain. Heb 11:4. Faith is a vital principle, without which all our services are opera mortua, dead works. Heb 6:1. Faith ameliorates and sweetens obedience, and makes it come off with a better relish. But why must faith be mixed with obedience to the commandments? Because faith eyes Christ in every duty, in whom both the person and offering are accepted. The high -- priest under the law laid his hand upon the head of the slain beast, which pointed to the Messiah. Exod 29:10. So faith in every duty lays its hand upon the head of Christ. His blood expiates their guilt, and the sweet odor of his intercession perfumes our works of obedience. "He has made us accepted in the beloved." Eph 1:6. Keeping the commandments must be UNIFORM. We must make conscience of one commandment as well as of another. "Then shall I not be ashamed, when I have respect unto all your commandments." Psalm 119:6. Every commandment has the same stamp of divine authority upon it; and if I obey one precept because God commands, by the same reason I must obey all. Some obey the commands of the first table -- but are careless of the duties of the second. Some obey the second table and not of the first. Physicians have a rule that when the body sweats in one part, and is cold in another, it is a sign of a distemper; so when men seem zealous in some duties of religion -- but are cold and frozen in others, it is a sign of hypocrisy. We must have respect to all God's commandments. But who can keep all his commandments? (1) When we make conscience of every command, when, though we come short in every duty, we dare not neglect any. (2) When our desire is to keep every commandment. "O that my ways were directed to keep your statutes!" Psalm 119:5. What we lack in strength, we make up in will. (3) When we grieve that we can do no better; when we weep when we fail; when we give bills of complaint against ourselves; and judge ourselves for our failings. Rom 7:24. (4) When we endeavor to obey every commandment, "I press toward the mark." Phil 3:14. We strive as in agony; and, if it lay in our power, we would fully comport with every commandment. (5) When, falling short, and unable to come up to the full latitude of the law, we look to Christ's blood to sprinkle our imperfect obedience, and, with his merits cast into the scales, to make it pass current. This, in an evangelical sense, is to keep all the commandments; and though it be not to our satisfaction -- yet it is to God's acceptance. Keeping God's commandments must be VOLUNTARY. "If you are willing and obedient." Isa 1:19. God required a free -- will offering. Deut 16:10. David will run the way of God's commandments, that is freely and cheerfully. Psalm 119:32. A musician is not commended for playing long -- but for playing well. Obeying God willingly is accepted. "Righteous deeds done unwillingly, are worthless." The Lord hates that which is forced; which is paying a tax rather than an offering. Cain served God grudgingly; he brought his sacrifice, not his heart. To obey God's commandments unwillingly, is like the devils who came out of the men possessed, at Christ's command --but with reluctance, and against their will. Matt 8:29. "Obedience is the chief thing, and this not through fear of punishment -- but for love of God." God duties must not be pressed nor beaten out of us, as the waters came from the rock, when Moses smote it with his rod -- but must drop freely from us as myrrh from the tree, or honey from the comb. If a willing mind is lacking, the flower is lacking to perfume our obedience, and to make it a sweet -- smelling savor to God. (1) Our willingness is more esteemed than our service. David counsels Solomon not only to serve God -- but with a willing mind. 1 Chron 28:9. The will makes sin to be worse, and duty to be better. To obey willingly shows we do it with love; and this crowns all our services. (2) There is that in the law-giver, which may make us willing to obey the commandments, which is God's indulgence to us. God does not require perfect obedience as absolutely necessary to salvation; he requires sincerity only. Do but act from a principle of love, and aim at honoring God in your obedience -- and it is accepted. In the gospel a surety is admitted. The law would not favor us so far; but now God so indulges us, that what we cannot do of ourselves we may do by proxy. Jesus Christ is "a Surety of a better testament." Heb 7:22. We fall short in everything -- but God looks upon us in our Surety; and Christ having fulfilled all righteousness, it is as if we had fulfilled the law in our own persons. God gives strength to do what he requires. The law called for obedience -- but though it required brick, it gave no straw; but in the gospel, God, with his commands, gives power. "Make a new heart." Ezek 18:31. Alas! it is above our strength, we may as well make a new world. "A new heart also will I give you." Ezek 36:26. God commands us to cleanse ourselves. "Wash and make yourselves clean." Isa 1:16. But "who can bring a clean thing out of an unclean?" Job 14:4. Therefore the precept is turned into a promise. "From all your filthiness, I will cleanse you." Ezek 36:25. When the child cannot walk, the nurse takes it by the hand. "I taught Ephraim also to walk, taking them by their arms." Hos 11:3. (3) There is that in God's commandments which may make us willing. They are not burdensome. A Christian consents to God's commands. "I consent to the law that it is good." Rom 7:16. What is done with consent is no burden. If a virgin gives her consent, the match goes on cheerfully; if a subject consents to his prince's laws because he sees the equity and reasonableness of them, they are not irksome. A regenerate person in his judgment approves, and in his will consents, to God's commandments; and therefore they are not burdensome. God's commandments are sweetened with joy and peace. Cicero questions whether that can properly be called a burden, which is carried with delight and pleasure. If a man carries a bag of money that has been given him, it is heavy -- but the delight takes off the burden. When God gives inward joy, it makes the commandments delightful. "I will make them joyful in my house of prayer." Isa 56:7. Joy is like oil to the wheels, which makes a Christian run in the way of God's commandments, so that they are not burdensome. God's commandments are advantageous. They are preventive of evil; a curb -- bit to check us from sin. What mischiefs would we not run into -- if we had not afflictions to humble us, and the commandments to restrain us! God's commandments keep us within bounds, as the yoke keeps the ox from straggling. We should be thankful to God for precepts. Had he not set his commandments as a hedge or bar in our way -- we might have run to hell and never stopped! There is nothing in the commandments, but what is for our good. "To keep the commandments of the Lord, and his statutes, which I command you for your good." Deut 10:13. God commands us to read his Word; and what hurt is in this? He bespangles the Word with promises; as if a father should bid his son read his last will and testament, wherein he makes over a great estate to him. He bids us pray and tells us if we "ask, it shall be given." Matt 7:7. Ask power against sin, ask salvation -- and it shall be given. If you had a friend who should say, "Come when you will to me, I will supply you with money," would you think it a trouble to visit that friend often? God commands us to fear him. "But fear your God." Lev 25:43. There is honey in the mouth of this command. "His mercy is on those who fear him." Luke 1:50. God commands us to believe, and why so? "Believe, and you shall be saved." Acts 16:31. Salvation is the crown, which is set upon the head of faith. Good reason then have we to obey God's commands willingly, since they are for our good, and are not so much our duty as our privilege. God's commandments are ornamental. "God's commandments do not burden us -- but adorn us." It is an honor to be employed in a king's service; and much more to be employed in his service, "by whom kings reign." To walk in God's commandments proves us to be wise. "Behold, I have taught you statutes: keep, therefore, and do them; for this is your wisdom." Deut 4:5, 6. To be wise is a great honor. We may say of every commandment of God, as Prov 4:9: It "shall give to your head an ornament of grace." The commands of God are infinitely better than the commands of sin, which are hurtful. Let a man be under the command of any lust, and how he tires himself! What hazards he runs to endangering his health and soul, that he may satisfy his lust! "They weary themselves to commit iniquity." Jer 9:5. And are not God's commandments more equal, facile, pleasant, than the commands of sin? Chrysostom says, "To act virtue, is easier than to act vice." Temperance is less troublesome than drunkenness; meekness is less troublesome than passion and pride. There is more difficulty in the contrivance and pursuit of a wicked design, than in obeying the commands of God. Hence a sinner is said to travail with iniquity. Psalm 7:14. A woman while she is in travail, is in pain -- to show what pain and trouble a wicked man has in bringing forth sin. Many have gone with more pains to hell, than others have to heaven! This may make us obey the commandments willingly. Willingness in obedience, makes us resemble the angels. The cherubim are described with wings displayed, to show how ready the angels are to serve God. God no sooner speaks the word -- but they are ambitious to obey. How are they ravished with joy while praising God! In heaven we shall be as the angels; and by our willingness to obey God's commands, we should be like them here. We pray that God's will may be done by us on earth as it is in heaven; and is it not done willingly there? It is also done constantly. "Blessed is he who does righteousness at all times." Psalm 106:3. Our obedience to the command must be as the fire of the altar, which never went out. Lev 6:13. It must be as the motion of the pulse, always beating. The wind blows off the fruit; but the fruits of our obedience must not be blown off, by any wind of persecution. "I have chosen you that you should go and bring forth fruit, and that your fruit should remain." John 15:16. Use. They are reproved, who live in a willful breach of God's commandments, in malice, uncleanness, intemperance; and walk contrary to the commandments. (1) Against REASON. Are we able to stand out against God? "Do we provoke the Lord, are we stronger than he?" 1 Cor 10:22. Can we match arms with God? Can impotence stand against omnipotence? A sinner acts against reason. (2) It is against EQUITY. We have our being from God; and is it not just that we should obey him who gives us our being? We have all our subsistence from him; and is it not fitting, that as he gives us our allowance, we should give him our allegiance? If a general gives his soldiers pay, he expects them to march at his command; so for us to live in violation of the divine commands, is manifestly unjust. (3) It is against NATURE. Every creature in its kind, obeys God's law. Animate creatures obey him. God spoke to the fish, and it set Jonah ashore. Jonah 2:10. Inanimate creatures. The wind and the sea obey him. Mark 4:41, The very stones, if God gives them a commission, will cry out against the sins of men. None disobey God but wicked men and devils; and can we find no better companions? (4) It is against KINDNESS. How many mercies have we, to allure us to obey! We have miracles of mercy; the apostle therefore joins these two together, disobedient and unthankful, which dyes sin with a crimson color. 2 Tim 3:2. As the sin is great, for it is a contempt of God -- a hanging out of the war flag of defiance against him, and rebellion is as the sin of witchcraft -- so the punishment will be great. Willful disobedience cuts off from mercy. God's mercy is for those who keep his commandments -- but there is no mercy for those who live in a willful breach of them. All God's judgments set themselves in battle array against the disobedient: temporal judgments and eternal. Lev 26:15, 16. Christ comes in flames of fire, to take vengeance on those who obey not God. 2 Thes. 1:8. God has iron chains of punishment to hold those who break the golden chain of his commands; chains of darkness by which the devils are held ever. Jude 6. God has time enough, as long as eternity -- to reckon with all the willful breakers of his commandments! How shall we keep God's commandments? Pray for the Spirit of God. We cannot do it in our strength. The Spirit must work in us both to will and to do. Phil 2:13. When the loadstone draws -- the iron moves. Just so, when God's Spirit draws -- we run in the way of his commandments. II. The thing forbidden in the (seventh - ed.) commandment is infecting ourselves with bodily pollution and impurity. "You shall not commit adultery." The fountain of this sin is lust. Since the fall, holy love has degenerated to lust. Lust is the fever of the soul. There is a twofold adultery. Mental. "Whoever looks on a woman to lust after her has committed adultery with her already in his heart." Matt 5:28. As a man may die of an inward bleeding, so he may be damned for the inward boilings of lust, if it is not mortified. Physical; as when sin has conceived, and brought forth in the act. This is expressly forbidden, "You shall not commit adultery." This commandment is set up as a hedge to keep out impurity; and those who break this hedge a serpent shall bite them. Job calls adultery a "heinous crime." Job 31:2: Every failing is not a crime; and every crime is not a heinous crime; but adultery is "a heinous crime." The Lord calls it villainy. "They have committed villainy in Israel, and have committed adultery with their neighbors' wives." Jer 29:23.